But the Passat wagon’s demise wasn’t the end of wagons at Volkswagen Of America. VW USA began selling Jetta wagons in the 2001 model year. When the sixth-generation of Volkswagen’s Jetta sedan rolled around and the Jetta ceased to be a Golf with a trunk, the Golf wagon (which had consistently been marketed as a Jetta SportWagen in the United States) continued to be sold as a Jetta SportWagen despite the fact that the Jetta SportWagen was no longer a wagon version of the Jetta sedan. Still with us? That’s all changed now. The Jetta will simply be marketed as a sedan. Volkswagen Of America is now selling the wagon version of the Mk7 Golf as a Golf. But it’s early going, and they sure aren’t selling many. Surprise, surprise. As the MK7 Golf SportWagen gets going, Volkswagen continues to rid itself of Jetta SportWagens. And as the two fight the good fight together, total Volkswagen wagon sales tumbled 28% to just 1488 units in April 2015, a deep dive from the 2076 Jetta SportWagens sold in the United States at this time a year ago. 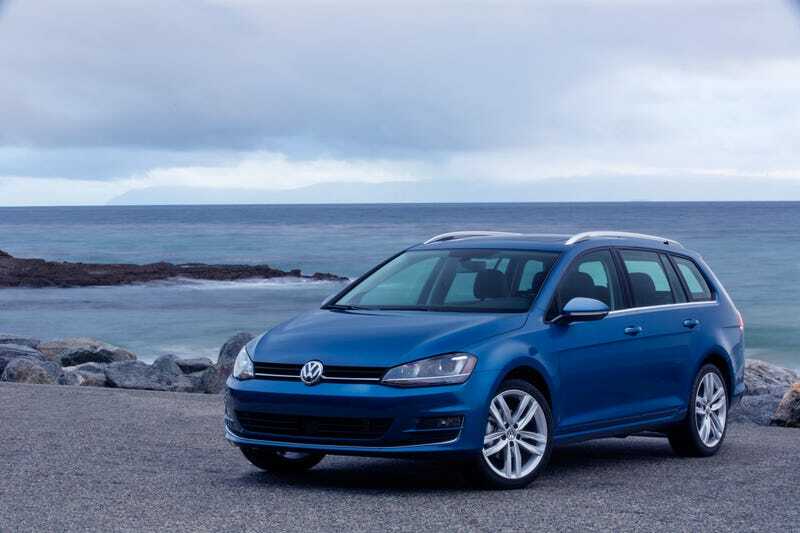 2015 VW Golf SportWagen: The Diesel Manual Wagon Is Alive In America! Granted, the Golf Sportwagen is only gradually becoming able to properly take over where the Jetta SportWagen left off. April was only the Golf SportWagen’s second month; only its first full month. The wagon lineup will be eventually be expanded by the Golf Alltrack, an all-wheel-drive rival for the Subaru XV Crosstrek (less capacity) and larger Subaru Outback (greater capacity). In the meantime, Volkswagen’s sales figures remind us of why rival automakers don’t really bother. Even the aging Tiguan, a remarkably low-volume vehicle considering the booming segment in which it competes, outsold the VW wagon fleet by 914 units in April. The story is similar elsewhere. Volvo sold 1139 V60s, V60 CCs, and XC70s in April alongside 1819 XC60 crossovers. BMW sold 8824 SAVs – X1s, X3s, X4s, X5s, and X6s – but likely no more than 500 3-Series wagons. Regulations and profit potential are certainly factors. But tops on a list of reasons that explain why more wagons weren’t sold in America last month, whether at Volkswagen or Volvo or any other of the few wagon sellers, is the fact that consumers possessed little interest and produced little demand. But hey, Audi’s A7 hatchback routinely outsells Mercedes-Benz’s CLS sedan. So there’s that.